makes that obvious. I don't even want to hear that I don't love you as much as the next pair. Because I love you more. to make their home elsewhere. This place is ours. Dear Parade Participants: Next year, ya may want to adult size your "candy throwers." My kids came home with approximately enough candy to last them til Halloween thanks to all the KIDS throwing it out! Dear Non Existent Blue Tongue: I made the assumption that you were blue. Because I was drinking a slushy with Jada and her tongue was blue. I wonder how many people were staring at me when I kept taking pictures of myself with my tongue hanging out. Awkward. Dear 109 Degrees: It's a good thing I'm not a cusser, cuz #$#%*&^%$*^ beeeeeeep!!! Dear Scott Walker: I know you have a lot of haters. But when you walked by us during the 4th of July Parade and my daughter fell out of her wagon onto the street, your concern was appreciated. Dear Caramel Frapp: You're so wrong for me, but you taste so right. Dear Christina (aka TicoandTina): Next week we get to meet in real life. Next week will be the time when my hugging theory in THIS blog post is proven out one way or the other. Will I or Won't I? To be Determined. Dear Kids: Daddy and Me are sorry we went through your toys this morning and threw bags and bags of them away. No, wait. No we're not. I think that was the most comments I ever got on a post. I mean, I know it was. You guys rock! Hahahaha. I'm dying laughing at the note to your kids and then the picture of you with the perfect smile on your face. Love your letters. You're absolutely gorgeous!!! LOL!!! we had a cockaroach on our patio. I heard my BF screaming at it to find a new home. To get away. I was like KILL IT. He just kicked it. I know that bug is coming back for vengeance. I dream about bagging up a bunch of toys!! Dream! I love your sunglasses too. Just sayin! This is HILARIOUS!!!! And, EWW roaches! Love it! Well, all except for the creepy roach, lol. At Christmas time, we went through all of our kids' toys and threw away 90% of them. It was glorious! Visiting from the blog hop! I totally understand the roach issue too! I love your new sunglasses too and everytie you post a pic of yourself in them I get jealous and want to borrow them! Hahaha love this. I know what you mean about throwing stuff out! My mom threw me and my sisters toys away once when we were at school and we came home devastated. I absolutely adore your anchor necklace! So pretty!! I bet your kids didn't complain about all the candy haha. Haha! That's too funny that you kept sticking your tongue out thinking it was blue. It may be even funnier that it didn't turn blue from a blue slushie. And good Lord 109*? Horrible. I hope it starts to cool off, because the rest of the country is making Florida look like the North Pole. Dear Julie! This is most awesome! And I don't care I would hug you in real life. 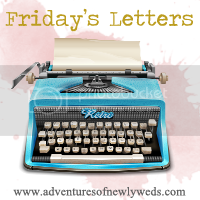 Popped over from the Friday Letters linkup...a roach? Ew! haha I am the same way with my new sunglasses, i love yours too! yuck to the roach and yay to the wonderful times spent with the ones you love. excited for you to meet your friend. my friend i traveled to utah to meet is coming here in a few wks and i am so counting down the days. Love your shades!! And I totally think you'll hung them both. Even if you aren't a hugger. I think they look like huggers. :) A bloggy friend of mine has her kids pick out "x" number of their toys around Christmas and place in "santa's bag" to help him deliver toys to children in need (which they donate to charity). So there's sort of a "even outness" (love my phrase?!?! lol) to the toy kingdom. NO, not the cockroaches still. Yikes. So gross. I feel for you. Yay for weeding through the kids' toys. We just did that last month and it felt SO good. Hope you have a lovely weekend. I love your "Dear" post. You always make me laugh Julie. I'm with you with those crazy roaches. We found a huge one in the back yard. Our little Jack Russel was rubbing her back unto it. Very unladylike like. I also just finished packing up the toys and clothes the kids don't use anymore. We save our for the next foster kiddos. Hope you had a wonderful weekend! I Guess We're Kinda Cool?? ?